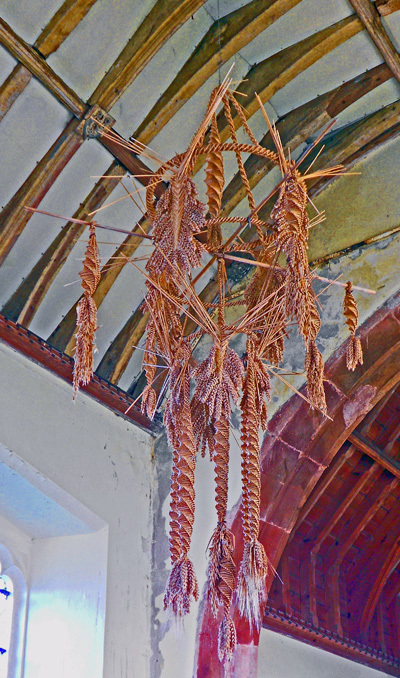 Probably due to the mechanisation of harvesting cereal crops, the tradition of making straw shapes and figures (‘corn dollies’) largely died out by the early years of the 20th century in Britain. From about the 1960s, the craft was revived, particularly for tourist souvenirs. The term ‘corn’ referred to cereal crops such as wheat, though nowadays corn can also mean ‘corn on the cob’ or maize. Many of the traditional and revived ‘corn dollies’ bore no resemblance to dolls or figures. Before the 20th century, local harvest customs were widespread throughout Britain, and although they differed from place to place, various elements were common to most. When the final patch of corn was cut, some straw with the ears of grain still attached (as in the picture above) was saved. Usually by plaiting or weaving, a figure or shape was made from this straw. It was then hung up in a building, often a farmhouse, barn or church, and was kept until the following year. Gathering the last stalks of straw was straightforward when cereal crops were cut by a scythe or sickle, but more difficult with a horse-drawn harvesting machine or huge modern combine harvester, so it easy to see why such traditions faded away. Sir James George Frazer (1854–1941) was an anthropologist best known for his work called The Golden Bough. The third edition (the largest and most complete) was published in 12 volumes and contained a mass of data from archaeological, anthropological and folklore sources. Frazer used this information to support his contention that all societies across the world had experienced similar stages of magical and/or religious beliefs during their evolution. Such cross-cultural studies were much in vogue during the late 19th century, but tended to ignore or play down the historical changes within different societies. His research is therefore often overlooked and his conclusions treated as invalid. These images were interpreted by Frazer as representations of a ‘corn spirit’, but in the 19th and 20th centuries, the reason for keeping a corn dolly was generally said to be ‘for luck’. Any deeper significance was long forgotten. A ‘doll’ or ‘dolly’ is usually a child’s toy that represents a baby, young child or adolescent, but corn dollies were not always doll-like or small, and some were so large that they were carried on top of a pole as an emblem or used to adorn the last load of the harvest. Even if Frazer’s theories have any validity, these corn dollies and their associated customs undoubtedly had more than one meaning over time. 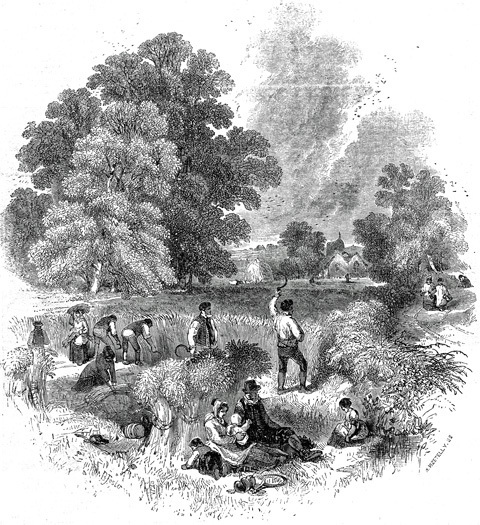 Frazer discovered that similar harvest customs took place in many other countries, not just Britain. He attempted to reconcile his theories with ancient Greek myths, and The Golden Bough actually referred to one myth, but with the Greek goddesses Persephone and Demeter, Frazer was faced with a problem. Persephone was the daughter of Demeter and Zeus, who was chief of all the gods. When Persephone was snatched by Hades, the god of the underworld, to be his queen, her mother Demeter searched the world in vain. Eventually Zeus released her, but not fully. Bizarrely, because Persephone had eaten some pomegranate seeds in the underworld, she could spend only eight (in some versions six) months of the year above ground. The remaining time had to be spent with Hades. This myth was understood as an allegory of the cycle of seed corn being planted in the soil and its emergence, growth and harvest, but it contradicted Frazer’s idea of a male corn spirit that needed to be ritually killed each year, especially as Demeter was also the central goddess of the Eleusinian Mysteries. Frazer’s convoluted explanation was less than convincing, but he was scrupulously honest when he ended his argument with the words: ‘It must not, however, be forgotten that this proposed explanation of such pairs of deities as Demeter and Persephone or Isis and Osiris is purely conjectural, and is only given for what it is worth.’ Although some of Frazer’s arguments are flimsy, his research remains an invaluable resource. Corn dollies are not especially durable, nor were they common, because only one figure was made each year in a small community. No really old ones are known, but there are possible representations in ancient art, such as in wall paintings within the Tomb of Nakht at Luxor in Egypt (Tomb 38). Another possible representation of a corn dolly has been noted on a pottery jar from the excavations of Akrotiri on the Aegean Greek island of Santorini, also known as Thera or Thira. This island, 120 miles south-east of mainland Greece, is the fragmentary remains of a volcano that blew up about 3,600 years ago. It was one of the largest volcanic eruptions in recorded history, leaving behind deep deposits of ash. It possibly triggered the collapse of the Minoan civilisation through the devastating tsunami and may well have given rise to the legend of the submergence of Atlantis. The island today has three main parts: the eastern half of the rim of the volcanic crater (the mainland of Santorini), a small central island formed by the remains of the volcanic vent, which is still active, and a fragment of the western rim. The importance for Greek archaeology is that the fall of ash covered ancient settlements, and a Bronze Age settlement was discovered beneath the ash in the south of the mainland. 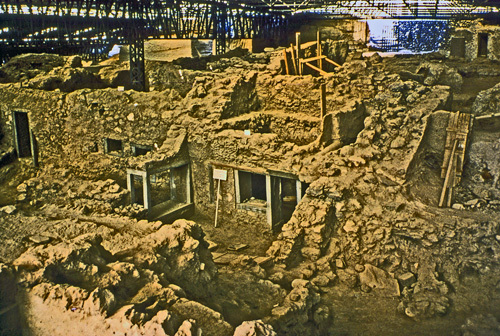 Large-scale excavations began in 1967, taking the name of Akrotiri, the nearest modern village. Extensive remains of buildings and their contents have been uncovered, leading to comparisons with Pompeii and Herculaneum in Italy, but it seems as if the inhabitants escaped before everything was engulfed. A large roof structure was built to protect the uncovered ruins, but it collapsed in 2005, and the site was closed for many years. The finds continued to be studied, and in 2009 Anaya Sarpaki published a paper called ‘Harvest Rites and Corn Dollies in the Bronze Age Aegean’ (pages 59–67 in Hesperia Supplements vol. 42, published by the American School of Classical Studies at Athens). Sarpaki draws attention to two designs on a pot that portray an object made of straw in the form of a circular wreath with a central cross and projecting ears of grain around the periphery. It looks something like a modern catherine-wheel firework. Sarpaki interprets these designs as representations of corn dollies and evidence of ancient beliefs related to the annual cycle of agriculture. If correct, corn dollies have a very long history indeed. This entry was posted on November 6, 2014 by adkins.